Each year Toastmasters hold two contests. In the Fall we have the Humorous Speech and Table Topics competitions. In the Spring we have the International and Evaluation Speech competitions. Contestants start out on the Club level and work their way up to Area, Division, and then to District. At each step the number of clubs participating multiplies and the number of people in the audience can increase from 15 to over 500. The winners of the District Spring English Speech Contests advance to an International competition where the audience can number over 5,000! Now that’s a beauty of a challenge for any speaker! This year I went to the District Conference as a contestant in the English Evaluation Contest. Sadly, I went 7 seconds overtime in the semi-final round. I was disqualified and could not go on to the finals. Sad of course, but still I had a fantastic time at the Conference! I hung out with people from all over Germany, from Czech Republic, Romania, Sweden, Denmark, Norway, Poland, and Ukraine. We stayed up talking over drinks till 1 a.m. and shared Toastmaster and life stories. It’s a great group of people, most of them use English as a second language. 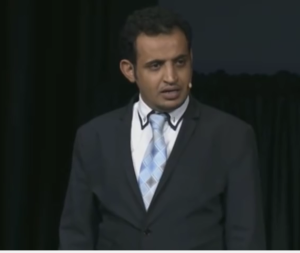 Our keynote speaker was the 2015 World Champion of Public Speaking, Mohammed Qahtani, an IT engineer from Saudi Arabia. Mohammed is a modest and very funny man who was always available to share a meal with a small group of us or just talk over drinks. He gave a solid keynote and even better workshop on how to build a speech. Speak from your heart: use emotion, connect to your audience, live your story. Speak as if it is the last time you will ever speak: throw yourself into it completely; if this is not how you want to be remembered, don’t say it. If you haven’t already seen Mohammed Quatani’s World Championship speech, click on the link below. His message is worth spreading. The Conferences are not just an opportunity to hear great speeches and learn from those who have mastered their craft. Conferences are an opportunity to visit an exciting new city. 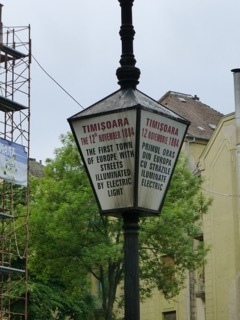 Timisoara is a city with a long history and the center of the 1989 Romanian Revolution. 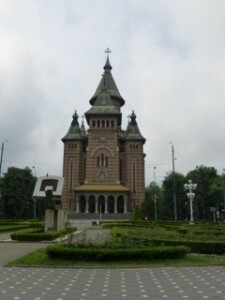 Timisoara Orthodox Church representing the major religion in Romania. Timisoara Lantern: Timisoara was the first European city lit with electric lights. 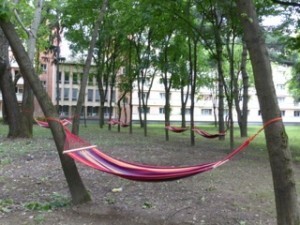 Timisoara Student Hammocks: Timisoara is a university town. There is a park in the Students Complex where hammocks hang between trees. These are for students to sleep in on warm nights. Police patrol the park regularly to insure safety and students talk to the wee hours of the morning and then fall asleep in the hammocks. Amazing! 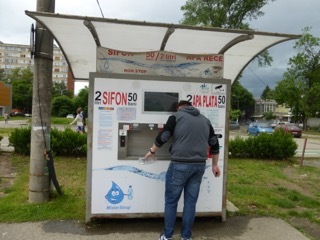 Spring Water Automat: City water is good, but local spring water is better! And available for pennies. Bring your own bottle! 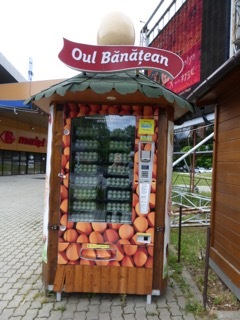 Timisoara Egg Vending Machine: great idea! If the markets are closed, you can still make yourself an omelet! 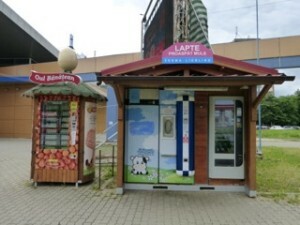 Egg and Milk Vending Machines: The egg (eggs sold in cartons) and milk (bring your own bottle) machines are an initiative to help local farmers. This way farmers sell directly to the public and can make a bit more money on their products. Timisoara had never made it to my list of places to visit. Thanks to Toastmasters, that changed last weekend. Through Toastmasters I go places which then become places I would gladly re-visit! Just one more reason to go to a Toastmasters District Conference. The next conference is the District 95 Fall Conference 2016 in Warszawa, Poland on the 25-26 November. The Key Note speaker will be the inspiring George Yen, Toastmasters International President 2013-2014. I hope to see you at the club or at a conference soon! ⟵DEBATE NIGHT: Convince me or, at least, persuade me!